I realized in the past month I posted so many party food recipes that I had enough to do a round up of them all. This way you can find them all listed in one spot. Try one or a bunch of them. What’s great is that they are all easy to make (or I wouldn’t be making them!). There’s mostly savoury party foods with a few sweet treats mixed in. I plan to make a few of them over the holidays to serve our guests. If you try any of them, please let me know what you think. 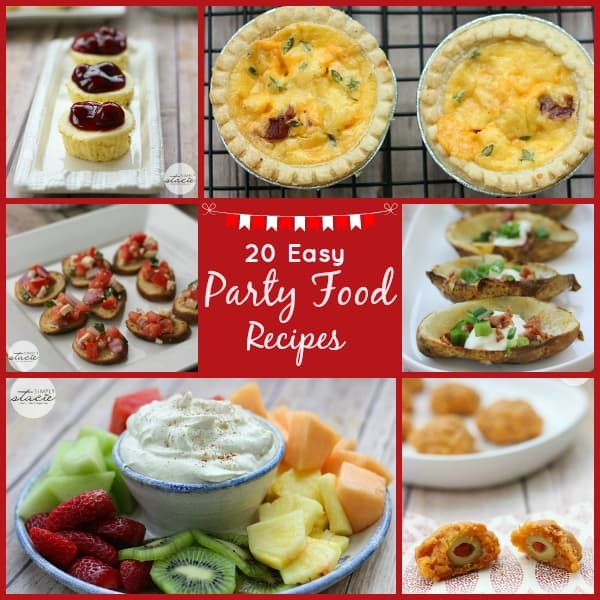 Here’s my list of 20 easy party food recipes- enjoy! What’s your favourite party food? These are totally my kinds of foods and appetizers!!!! Love the mini quiches and the potatoe skins!!! YUMMMMMM!!!! That is a great collection of party food! I cant wait to try them. Wow a lot of awesome ideas, I am going to be making at least 2 of these on Christmas Eve. Thanks for the great recipes!! it’s making me hungry just looking at all these wonderful appetizers. I love potato skins, in fact there’s not much there that I don’t like – who needs a waistline! My favorite party food is anything with chocolate in it, preferably dark chocolate. Thank you for sharing these great recipes. I am totally going to try a few of these! I love jalapeno poppers so I’m going to try your stuffed jalapenos! Thanks for the round-up for these recipes! Some great ones, several that I am going to try over the holiday season. Should not read food related posts right before breakfast, it makes me hungry. I love the roasted grape tomato and basil crostini recipe and plan on serving it on the 1st for brunch, and the pizza muffins are actually great for school lunches. Nice set of recipes! Thanks for the post! We just decided that we are hosting Christmas this year…yikes. I needed some appetizer ideas. These look great. Excellent recipes! I want to make the ginger meatballs! my fave is chocolate covered. You have a great collection of party food recipes. The recipes all sound scrumptuous and I look forward to making some of them in the near future. Thank you. i would like to try the Chocolate Banana Bites. They sound good. Yum!! these all look so delicious, making me hungry! Definitely wanting to try a few of these out. Thanks for sharing! All looks so delicious, definitely wanting to try a few of these out. Thanks for sharing! Simplicity is key when you are preparing food for a party. The last thing you want is to make numerous complicated recipes that are hard enough one at a time, and are near impossible when you are trying to multitask. This is a fantastic list of party food recipes 🙂 Definitely going to try a few for this weekend’s parties! What a great round-up! Thanks for the ideas and recipes. I can pretty much guarantee that at least one or two of them will find their way onto our table–the Chocolate Banana Bites and Ginger Meatballs, in particular, sound great (although not together, LOL). Probably not the Escargots, though! Thank you for all your recipes, I made the Ginger Meatballs and everyone really loved them. I can’t wait to make your Goat Cheese & Sun-Dried Tomato Mushrooms. Thanks for posting this, I can use some of these ideas for new years! These all sound delicious! I m going to have to make some for New Year’s Eve! wish i saw this post sooner! but will definitely be referring back to this for my next dinner party! Great ideas for a new years eve get together. Great Appetizer ideas!! Now it’s time for the low fat ones!!! Wow, those Olive Cheese balls look amazing! I love making appetizers like this for dinners, and having a movie night. Definitely going to have to add this to the rotation! yummy – makes me wanna bake! I am definitely trying the cheesecake and potato skins. I may try them all!!! The Cheese Stuffed Jalapenos look delicious! Also, the ingredients are simple and they look easy to make! These recipes look so good. I’m always trying to find something to make when family comes by and these would hit the mark. The Cheddar, Pancetta & Thyme Mini Quiches are the first one on my list to make looks so good.